Back in the day, when I had my first apartment in New York, I was poor. I mean broke. I ate a lot of mussels because they were cheap. If you were invited to dinner at my place, chances were that you were going to eat mussels and drink red wine out of a jug. I ate my fill of mussels, but every once in awhile I find mussels that are sublime. A few weeks ago we went to our favorite beach spot, Monte Conero, on the Adriatic side and we had lunch at Anna’s. It’s just a beach shack, but the seafood is local (as in the fishing boat is outside restaurant) and the ambiance is genteel funky. The mussels there are a local specialty and Anna serves them steamed with bits of cut up lemon and fennel fronds. Today at the COOP (grocery store) they had mussels from the Ancona, which is the major city right by Monte Conero, so I had to have them. Clean the mussels. Now, if you are using farmed mussels, it’s not a big deal, give them a rinse and pull off any of the ‘beard’ or stuff that is hanging out of the shell. The Ancona mussels are not farmed, they are wild and they come with a ton of barnacles attached and lots of beard. Wear gloves or something to protect your hands if you are cleaning off barnacles because they are like razors. I completely spaced out, was in a hurry and didn’t realize I’d sliced my thumbs to ribbons until I grabbed the lemons. You get the picture. Place one anchovy (oil or salt preserved) in a small amount of olive oil in a flat pan big enough to hold all the mussels, and gently warm until the anchovy falls apart, about a minute. Add the splash of white wine and then everything else. Cover the pot. 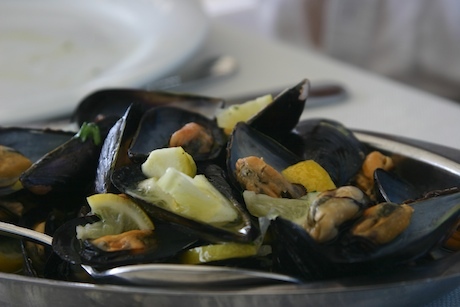 As soon as the mussels open, serve immediately. Tastes just about perfect with a Verdicchio, or any other very crisp white wine. Do not drink a US chardonnay with this dish; I don’t care if that’s what you already have open. Crusty bread for sopping up juice is always a good thing. Enjoy.